will be resumed as soon as possible. Someone in their wisdom decided to change our phone provider which led to a few days of an internetless house. 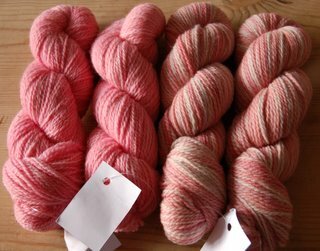 I promised chocolate brownies and I have lost the photo, it maybe still on the camera, so in the meantime I will leave you with new sock yarn instead, it is very pink but I love it, I am now in a mad dash to finish up the couple of odd socks lying around. I’m off to Creativa (craft fair) to see whats new, this morning, probably nothing exciting though, more later….. I think your yarn is very pretty! I just bought a swift for winding yarn skeins into balls on my yarn ball winder. Sure beats hanging the skein on the back of a chair (or making my husband hold the yarn and turn slowly around in the living room.) I don’t even want to know what my neighbours must think if they look in my front window. Hi Marjorie, I make one of the boys hold skeins I need to ball, it holds them captive for a little while, I do usually have to bribe them though!